Valentios ("Eddie") Valentis, has over 25 years of shipping industry experience, including owning, operating and managing tankers. He has founded Pyxis Tankers Inc. and is serving as Chief Executive Officer and Chairman of the board of directors since inception. 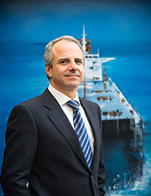 Mr. Valentis is also the President of Pyxis Maritime Corp., a company he founded in 2007. In 2001, Mr. Valentis was appointed President/CEO of Konkar Shipping Agencies S.A., a drybulk operator based in Greece, which is a position he continues to hold. From 1998 to 2001, Mr. Valentis was the Commercial Manager for the L.G.Matsas shipping group. From 1996 through 1998, Mr. Valentis worked as a dry cargo chartering broker and from 1989 to 1995 he was involved in the commercial operation of drybulk vessels.